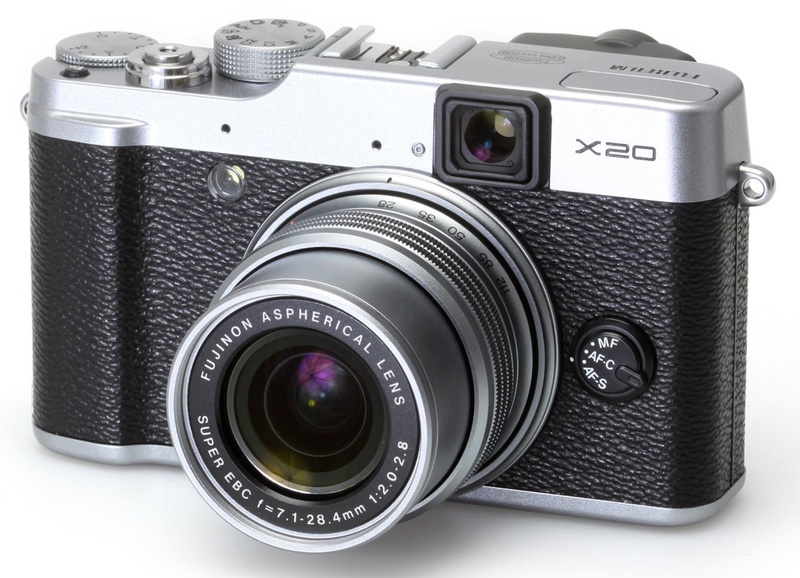 Fujifilm has tempted me since initially releasing the X10. Now they've done it again with the X20. DPReview just published their Fujifilm X20 hands-on preview, and it looks like my temptation will become even more intense. I spent some time with the Fujifilm X20 at CES and was reminded of just how handsome and capable this compact camera is. Inside its die-cast magnesium body is a new 12MP 2/3" X-Trans CMOS II sensor coupled to a Fujinon 28-112mm f/2-2.8 zoom lens. 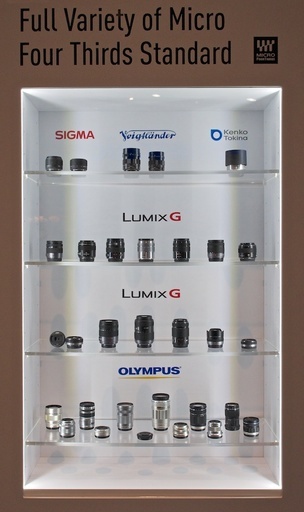 Fuji's sensor is larger than much of its competition, including the Canon G15 and Panasonic LX7 that both use 1/1.7" chips. But what really brings all of these specs to life is the look and feel of the camera. It is flat-out handsome, and feels solid and competent in the hand. This quality comes at a price. You can preorder either the black, or the new silver and black model pictured here, for $599 at B&H Photo. Considering the specs I mentioned earlier, plus the Intelligent Hybrid AF System, full HD 1080 video at 60fps, RAW capture, built-in film filters, and more, this camera is a quality investment for photographers looking for a capable all-in-one camera to complement their DSLR kit. 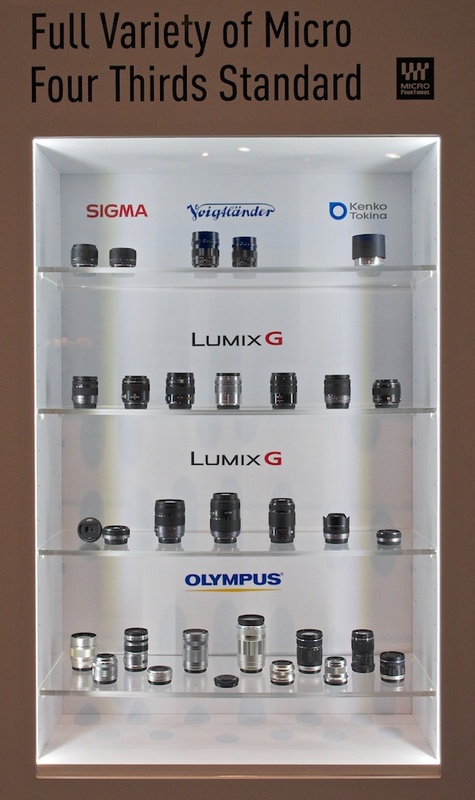 I found this display of micro four thirds lenses by a variety of manufacturers in the Panasonic booth at CES, and I thought that some of you would appreciate how this catalog of glass has grown recently. 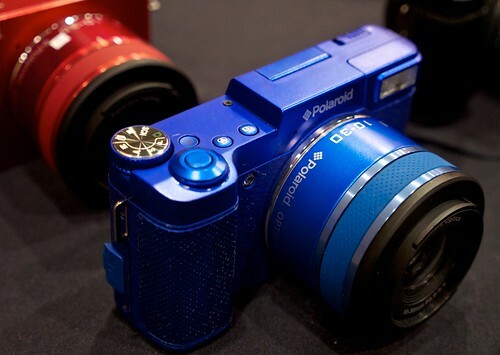 Polaroid was showing off their new Android-based camera at the Pepcom Digital Experience on the eve of CES 2013. Aimed at snapshooters, this CSC features a 10-30mm zoom with a 3.4" touchscreen LCD, powered by Android 4.1 Jelly Bean operating system. Yes, you can load apps and access the Internet via the camera's built-in WiFi radio. The performance for the demo model, however, was a bit sluggish. And it did crash once during testing. 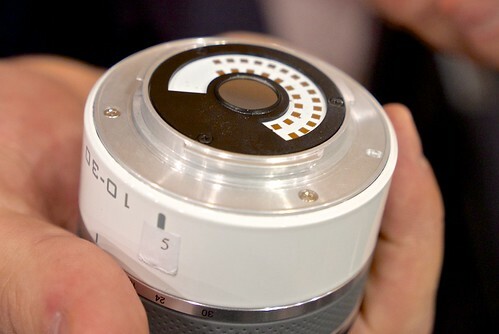 A very unique feature is the location of the sensor: it's in the lens. No need to worry about dust and contaminates because the sensor is never exposed. Estimated price will be $349. Based on what I saw, I can't recommend it, even though it costs less than other system cameras. The fit and finish of the components was less than stellar, the OS felt unstable, and I'm just not sure about the lens design. We'll see what others report. But for the time being, this seems more like a novelty item rather than a legitimate photographic tool. 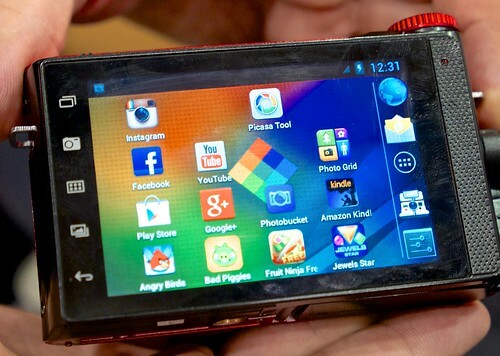 During the first day of press events at CES 2013 in Las Vegas, we're seeing a number of gadget mashups. A primary ingredient is mobility. It seems to spice up to everything from cameras to laptops to cars. A good example on display at the CES Unvieled event at the Mandalay Bay Hotel is the Lenovo ThinkPad Helix that represents the fusion of laptop and tablet. 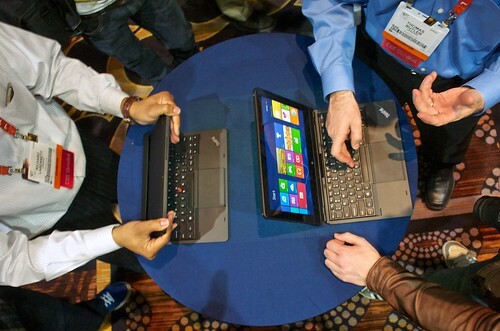 The Lenovo ThinkPad Helix being demonstrated at CES Unveiled. The device is built around an 11.6" touchscreen tablet with 1080p resolution, Core i7 processor, 8GB of memory, and 256GB of solid state storage. Lenovo chose to use Windows 8 Pro as the OS rather than the mobile version of the operating system. And when you dock the tablet to the keyboard, it both charges (via the second battery) and supercharges (via overclocking the processor) the tablet. The Helix can be used in a variety of configurations for work, display, and portability. Another area of convergence is how we're doing business. 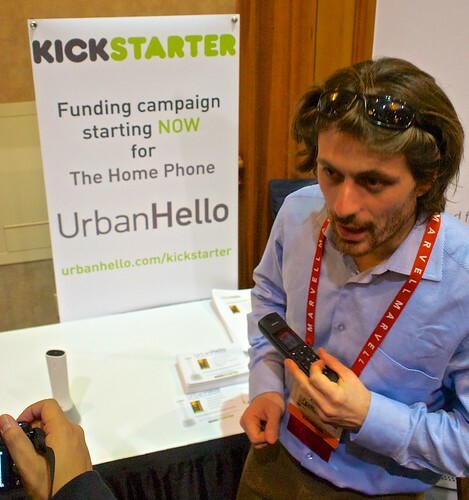 KickStarter projects such as the Urban Hello phone that connects itself instantly to any internet gateway for home phone service. What's interesting to me is that the Urban Hello won a CES Innovations award, yet the fundraising has just begun to actually produce it. For the Nov. 2012 Photo Assignment, TDS shooters shined a light on their favorite subjects. See for yourself in our gallery, Flash. And which one will be the SizzlPix Photo Assignment Pick of the Month? "I was so excited when you announced flash was the contest for this month. As wedding photographers, we often shoot in low light and rely on flash to capture spectacular images, including light paintings," wrote Jennifer Rhoades. "This was shot in pitch black. 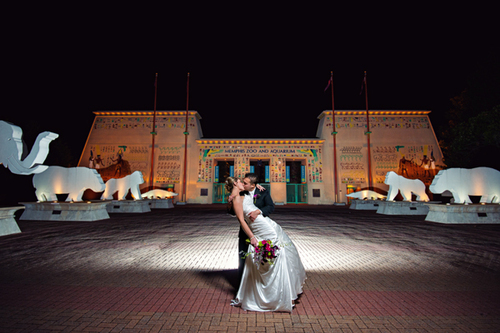 Laurie and Blake wanted a shot in front of the Memphis Zoo, but it was 9pm! I put two SB-910s behind them pointing left and right, and my assistant held a 24 inch softbox above their heads. 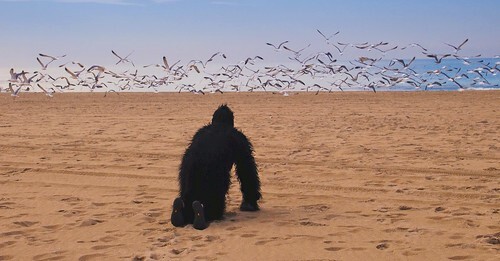 The image was shot with a D800 and a 16-35 f4 VR." See all of the great images from this month's assignment by visiting the Flash gallery page. The Jan. 2013 assignment is "Self Timer." Details can be found on the Member Participation page. Deadline is Jan. 31, 2012. Please follow the instructions carefully for labeling the subject line of the email for your submission. It's easy to lose these in the pile of mail if not labeled correctly. For example, the subject line for this month's assignment should be: "Photo Assignment: Jan 2013." Also, if you can, please don't strip out the metadata. And feel free to add any IPTC data you wish (These fields in particular: Caption, Credit, Copyright, Byline), I use that for the caption info. Gallery posting is one month behind the deadline. So I'm posting Nov. 2012 at the end of Dec., the Dec. gallery will be posted at the end of Jan., and on and on. With 2012 in our rear view mirrors, I want to thank you for being a part of our photography community. Thanks to your support of the podcast via subscribing to it through iTunes, purchasing the TDS Podcast App in the App Store, participating in photo assignments, commenting on articles, and shopping at B&H, Amazon, SizzlePix, and Red River Paper though our sponsor tiles, you've contributed to keeping this show on the air. 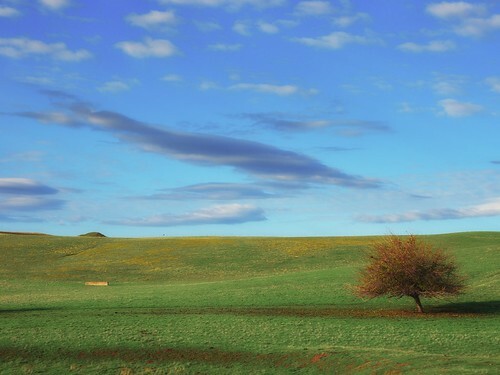 Sky and Tree, Interstate 5, CA - Photo by Derrick Story. I'll be back to full steam next week with more podcasts, news, opinion, and articles. I'm thrilled that you'll be starting the New Year with me. One of my favorite phrases on the road is, "Come here and look at this." When I hear that, I make sure I have camera in hand. 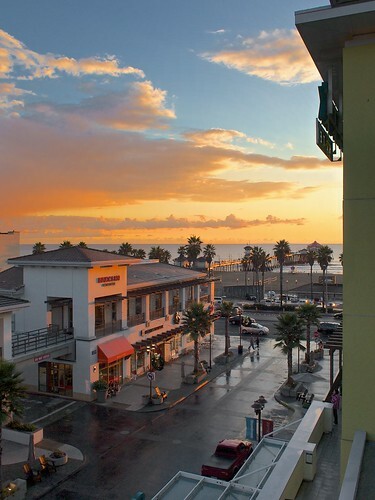 The sunset last night on Main Street in Huntington Beach was saturated honey. I had an Olympus mini in my pocket with the 17mm f/2.8 prime lens, and used it to capture this scene. I finished off the image in Aperture 3.4, later that evening after returning from dinner. What a great way to end the day.